Confirmation bias was much in evidence earlier this week, when a small tsunami of press and media reports of a new ‘research’ report by My Family Care on the little-loved Shared Parental Leave – and in particular the report’s headline ‘finding’ that there has been “just one per cent take-up so far” – had a lot of employment lawyers, wonks and HR specialists nodding along and tweeting their lack of surprise. Including me, initially. But then it was just after midnight when I read the Guardian article that had just appeared online, and I had drunk a certain amount of wine. However, at about the same time, somewhere in Scotland, the former BIS employment relations minister and chief architect of SPL, Jo Swinson, was punching holes in walls and kicking the cat. NB: This may be an exaggeration. I don’t even know if Jo has a cat. She may well not have been in Scotland. But if spouting dubious ‘facts’ is good enough for My Family Care and the Women’s Business Council (who endorsed the ‘research’ report) it’s good enough for a humble blogger. Certainly, there was some wailing and gnashing of teeth in the Swinson household. For Jo had immediately noticed what legions of journalists and news editors at the Guardian (“Tiny proportion of men are opting for shared parental leave“), the Independent (“Only 1% of fathers [sic] take opportunity to split time off“), Sky News (“just 1% of fathers [sic] have chosen to opt for Shared Parental Leave“), BBC Breakfast (“Shared parental leave: only 1 in 100 dads take what they’re entitled to“) and elsewhere failed to spot: that My Family Care’s ‘research’ is little more than garbage, and their ‘1%’ figure utterly bogus. Because My Family Care’s 1% figure is not the percentage of ‘new fathers eligible for SPL’ who took SPL, or even the percentage of ‘fathers’ who took SPL, as suggested in the above self-congratulatory tweet by My Family Care. Rather, as is revealed on page 9 of the My Family Care report, it is the percentage of “all male employees” (in their sample of 200 employers) who took SPL. Which, as was quickly noted by Sarah O’Connor of the Financial Times – one of the few journalists to consistently apply journalistic scrutiny to the stream of press releases sent to her by PR agencies – is “nonsense”. That is putting it mildly. It is in fact nonsense on stilts, and if there was any justice in the world My Family Care and the Women’s Business Council would now be spending a very, very long time on the naughty step. And a lot of journalists would be getting booked onto a refresher course at journalism school. For, in any one year, the vast majority of male employees do not become a father, so simply cannot take shared parental leave, however much they might want to. As Jo Swinson later noted in the Financial Times, My Family Care might just as well have issued a ‘research’ report with a headline ‘finding’ that only a small minority of female employees take maternity leave. According to the February 2013 BIS final impact assessment on SPL, there are about 540,000 maternities each year in which the mother has a partner who is a ‘male employee’ (i.e. she is not a lone parent, and her male partner is in employment). And it has been estimated by the TUC, Working Families and others that only about 60% of those 540,000 new fathers will actually qualify for SPL. 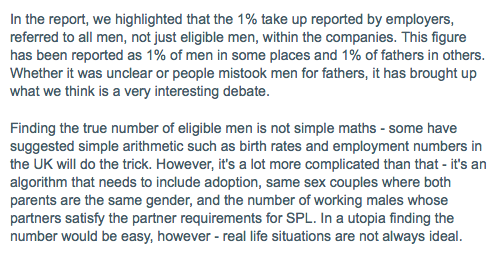 So, in ‘SPL’s first year’, about 324,000 male employees became eligible for SPL. However, My Family Care’s 1% figure is not simply bogus – it also fails to reflect their own ‘research’ findings. Buried away on page 20 of the 26-page report is a chart showing that, among the (very small) number of male employees in their sample who had actually become a father in the last 12 months, more than 30% had taken SPL. More than 30%! Yes, the ‘research’ is so sloppy that My Family Care don’t even bother with the exact figure. Yet the Government’s own forecast (which we can safely say was optimistic) was just 2-8%. Which begs the question, should My Family Care and the Women’s Business Council have issued a press release headlined “Shared parental leave a stunning success!”? To which the short answer is: No. Because, as just noted, the size of the sub-sample of employees interviewed who were new fathers is far too small to be meaningful, and we have no idea whether the 200 employers they selected are in any way representative (My Family Care didn’t bother to include any explanation of their ‘research’ methodology, perhaps because that would simply have confirmed how shoddy the methodology was). This is not the first time that someone has used the device of paper-thin ‘research’ on shared parental leave to get their organisation’s name in the paper – indeed, My Family Care have form. And, given the evident gullibility/stupidity of so many journalists and news editors, I don’t suppose it will be the last. But, as the employment team at law firm Lewis Silkin noted on Twitter yesterday, “until there is good data, all anyone can say on SPL take-up is that it is somewhere between 0% and 100%”. Postscript: At least some at the BBC have recognised the error/laziness of their colleagues, with Radio 4’s “More or Less” describing My Family Care’s 1% figure as “massively misleading” and “one of the worst statistics we’ve ever reported on”. This entry was posted in Equality and tagged Equal parenting, Shared parental leave. Bookmark the permalink. I’m one of the men who has taken SPL (never thought I’d ever be known as a one-percenter!) and I was pretty annoyed at the research and particularly the way it was reported by reputable news organisations. The thing everyone will remember now is that SPL doesn’t work and 99% of dads aren’t interested. As you say, we won’t know for a couple of years what the impact has been so I’m glad someone has taken the reporting of this research to task in this way. As a keen follower of your blog I knew you’d be onto this one! The sample is still very small, but suggests that the take up among the potentially eligible group is about a third. Yesterday’s article in the evening standard (which you probably will have seen) paints a rather rosier picture about SPL (“Dads on tour”) but makes no pretence of being “research”. This is very good. But I think “begs the question” should be “raises/prompts the question “. Properly, “beg the question” means “assume what you set out to prove”. So a question-begging argument assumes its conclusion – ie it’s circular. Journalists use “beg the question” because it sounds exciting and dramatic. Sorry for pedantry. But I thought you might appreciate it.